Everything you need to know about business in the 21st century you can learn from Everything I Know About Business I Learned from the Grateful Dead. Traditional approaches to business haven’t led to the outcomes most businesses expected especially today after the nearly fatal effects of the financial meltdown of 2008. The “tried and true” approaches have failed to live up to their promise. So maybe you’re ready for a radically different perspective on running a business or organization, one that’s authentic, humane, passionate, value-driven, truly customer-centric and most important–one that can respond quickly to unforeseen changes and crises. 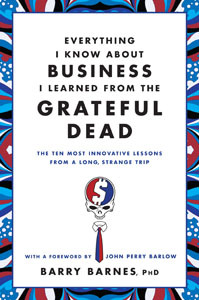 This book shows you how the Grateful Dead successfully navigated the turbulent music industry for 30 years by modeling their organization on their improvisational musical approach, and you’ll see how your business can strategically improvise in turbulent times. You’ll find out how the Dead created a unique business model more than 40 years ago that’s become a common model for many bands today and can be applied in other industries today. You’ll understand how the Dead anticipated social networking before there was an Internet, and how you can benefit from their actions.